Since 2014, Rhodium Group has provided an independent annual assessment of US greenhouse gas (GHG) emissions and progress towards achieving the country’s international climate commitments. In this, our 2017 “Taking Stock” report, we update our forecast to include policy changes under the Trump Administration, new EPA GHG inventory estimates, and energy market and technology developments over the past year. We find that under current policy, the US is still set to come within striking distance of it’s Copenhagen target of a 17% reduction below 2005 levels by 2020. 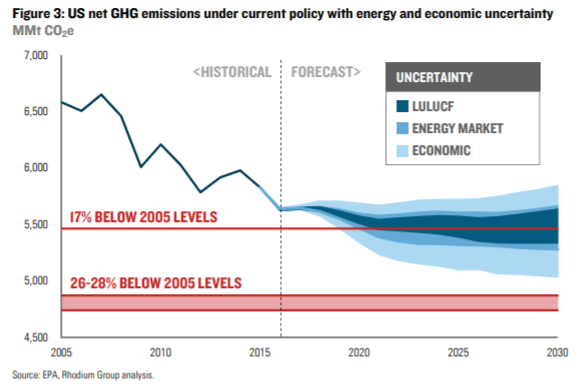 But absent new policy (whether at the federal or state and local level), the US is on course for a 15-19% reduction in GHG emissions by 2025 – considerably short of its 26-28% commitment under the Paris Agreement. There is still time to correct course, whether at the subnational level over the next couple years or through new federal policy a little further down the road. But with President Trump’s election, it will certainly be a tougher lift. What a difference a year makes. In our last installment of Taking Stock, we summarized a raft of new policies adopted or proposed by the Obama administration as part of the Climate Action Plan. Since then, President Trump has made good on his campaign promise to undo his predecessor’s climate agenda, signing an Executive Order (EO) March 28 that directed agencies to rescind any pending rules and regulations related to the Climate Action Plan and instructed EPA to review and potentially withdraw Obama’s signature rule, the Clean Power Plan. Now the Trump Administration is considering whether to fulfill a second campaign promise to “cancel” the Paris Agreement. After much internal back and forth, the administration has indicated it will make a decision on the fate of US participation after President Trump’s trip to the Group of 7 (G7) meetings later this week. Contributing to the unease among some administration officials is the likely inability of the US to meet its Paris commitment while fulfilling Trump’s campaign commitment to tear up the Climate Action Plan. International negotiating partners are also trying to gauge the impact of Trump’s policy agenda on America’s emissions trajectory, and state, city and corporate actors are exploring opportunities to mitigate the damage. Of course policy alone doesn’t determine a country’s GHG emissions, a combination of policy, economic, technological and market factors do. Recent developments in clean energy technology, energy efficiency, and oil and gas production as well as economic growth dynamics are also shaping America’s emissions future. In this edition of Taking Stock, we present US GHG emissions projections that account for these recent economic, market and technology developments as well as changes in federal and state policy since the end of 2015. This is a forecast based on policies on the books today, not an assessment of US emission reduction potential. As we note above, a lot can happen in a year, let alone a decade. Changes in state and local policy either independent of the new administration or in direct response to it, will shape future US emissions, as will the outcome of the 2020 Presidential election. But the forecasts presented here provide a useful signpost for where the US is headed as of today, and how much work remains to be done.